Three hundred and sixth five days. A whole year; twelve months. We sat in traffic. It was a busy Wednesday morning rush hour. I’m anxious, excited and ever so scared. It felt like make or break time; would these doctors also recommend surgery? Did I have more choices than the scalpel? I was in agony. I knew I was sick and I knew that I would probably choose surgery but who wants to make that decision? Without more opinions and more information? No, today was necessary. I was curious about the new and different hospital; explaining my history to a new consultant, letting him judge me medically. Not knowing who I am, who I was, how hard I want to not be sick. Would I get given time? Did I have time? This is an excerpt from an old, unpublished posted from January 28th 2016. One year ago today, me and my boyfriend travelled to Nottingham to see a specialist about my Crohn’s disease. My regular, usual consultant here at home had suggested it might be a good experience to see what else could be done. I was failing everything, at this point. My body just couldn’t process the Infliximab anymore, even with the high dose of Methotrexate, so we were sceptically trailing Vedolizumab. I was looking at the next step being a surgery. The consultant in Nottingham was nice, gave me the time to talk and explained to me my options from his clinical perspective and experience. It wasn’t going to be easy or quick; it would take months of being a regular patient to possibly ‘fix’ me at his hospital or have surgery. Not an easy choice, any which was I looked at it. And boy, did I look at it. I remember for days after that appointment, I would wake during the night and panic. Imagining potential surgeries, medications, complications; of being sicker for longer and harder than ever before. It was bleak. I don’t know how I came to decide on surgery, but I eventually did. 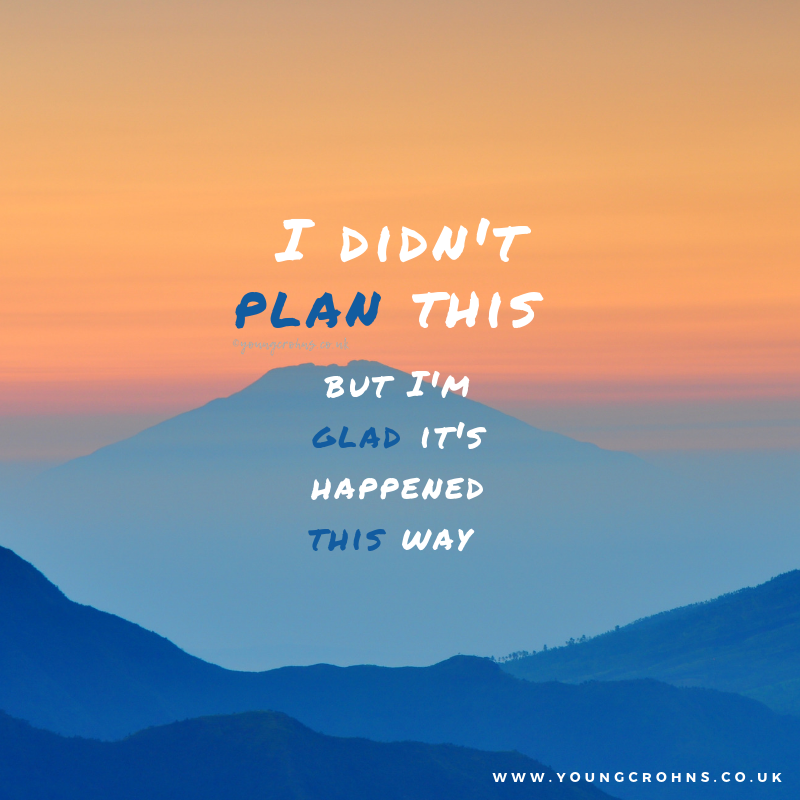 I was in the mist of finishing Vedolizumab, having a scope done, a flare up started and it all started to go south; quietly at first and then it gain speed. I just wanted out of what was going on; to be fixed, at least for a while. Of course, no one ever said surgery wold fix me but this was what I would tell myself to reassure myself I was doing the right thing, medically, for myself at that point. I would prepare myself too; I would read up on it, ask questions and gather myself for intense pain that would hopefully help the constant chronic ill pain I was in. The Right Hemicoloectomy worked for a while. But then I didn’t continue to recover. Months of pain came and in August I was admitted again – third time’s a charm and all that – with the colonoscopy that would determine my current status: my colon was destroyed by disease and I would lose it and become a ostomate. Weirdly, I had mentally prepared myself for a temporary stoma with the Right Hemi operation. When I woke up without one, I was relieved. That was obviously premature. 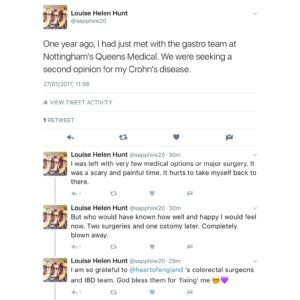 My acceptance in that period of time, certainly helped me cope in August; both before and after ostomy surgery. One year ago, if you had told me that I would be here, writing about how much I love ostomy life, I wouldn’t have believed you. I didn’t plan this but I’m glad it happened this way. Those three months of hell – and they were, no doubt about that – between June and August 2016 I will never ever forget for as long as I live. I replay them, knowing that anything is better than that. What I felt and went through in those months has changed me, for the better. I am more acutely aware of what pain is and how high my tolerance is now. I know what inner strength I have and how determined I am to see the good in things. I know how to appreciate good days over the bad ones that come along. And lately, I know how bloody luckily I am to have had surgery when I did, in the NHS, with my surgeon and his amazing team, receiving care and advise from wonderful stoma nurse and IBD nurses. Those who complain about the delays in the health system here in the UK know nothing of it until you are a chronically ill patient or care for someone who is. It is not a perfect system and it is constantly under pressure to meet targets and goals in a society when people are living longer, suffering with more illness and struggle to feel well – both mentally and physically. But I appreciate it for what it is because it has always been there for me when I have needed it. I hope now, I won’t need it like I used to for a long time. I just hope it is still here when I do. Please don’t let it get destroyed. Please fight for it. Please.